Super Hero Boy: Word World on my table! Word World on my table! WordWorld was one of those cartoons that sort of snuck up on me. I never sat out to watch it as we tend to watch very little TV and I'm a creature of habit turning on the TV at just the right times for the shows we watch or using our DVR. I'm really not sure how it came to be one of our most cherished shows but I think it was a glimpse of Dog, our favorite Word World character that peeked my interest. At first glance I was a little thrown off by these animals running around shaped as words, it seemed all a little odd to me. Though from the sheer fact that we have used other early learning, reading, shows since Connor was old enough to watch.. it did not take me long to realize that this could be yet another tool in my quest to teach Connor reading skills before his peers. WordWorld has turned into one of our favorite shows, not to mention the animals build everything they need from the letters around them which means that children are watching as its a really fun cartoon but while they are having fun and enjoying the show, spelling skills are snuck in at every corner. Every item in the show, every character, every plot involves building a word as in WordWorld everything is made of the letters that make up the word. It's really quite genius! When I saw the WordWorld Magnetic Playsets it was love at first sight. Sticker books were a huge favorite of mine growing up and the novelty of using stickers to make a scene was always a great activity for a car trip, the only issue is once your done with placing stickers its very difficult to reuse them. Magnetic play sets are the perfect solution that satisfied that sticker urge but allows for reuse. We got our hands on one of the WordWorld Magnetic Playsets and though Connor is too young to be left alone with his as I fear he may eat one of the pieces thus yet, but we absolutely love to play together. The magnet board is generously sized so there is plenty of space to arrange your magnets any way you choose. 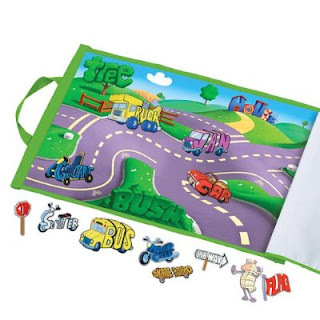 The best part is the fact that once your done playing the board folds up and turns into a little briefcase that not only stores the magnet board but all the magnets as well which means its super easy to keep everything together and even easier to grab and go for those road trips or just trips to daycare. You can pick up your own WordWorld Magnetic Playsets over at Target!